We have a wide assortment of Torch Caps which has become a necessity for everyone due to immense power shortage. 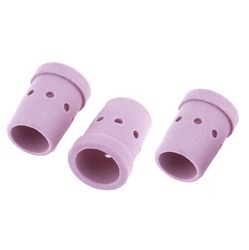 These Torch Caps are specifically designed as per the customer requirements and are available in different design & sizes. We are recognized as the industry leaders by rendering high grade TIG Ceramic Nozzle. Known for its resistance against corrosion and high functionality, the product is obtained from reliable sources. We are counted among the well-reputed entity for providing Mig Torch. In addition, our esteemed patrons can avail this product from us in various designs as per the specific requirements. By utilizing the cutting edge technologies that are installed at our hi-tech infrastructure, we are manufacturing and supplying an extensive array of ID Torch. 36 KD Torches from Abicor Binzel are the largest selling MIG Torches in India.